Software engineering is the creation of digital environments, that facilitate and encourage human activity; reflect or adapt to individual voices and content. In addition to being Eucleo's top software engineer and technical mind, Mark is responsible for Eucleo's day to day operations and leading the charge to define Eucleo's future direction and success. Mark also spearheads the development of Eucleo's technical strategy. Mark co-founded Eucleo in late 2010 with long-time co-worker, office mate, and close friend: Adrian Porter. Their vision at the time was to provide a lean and highly talented development team that could support the Warfighter more rapidly and efficiently than the behemoths bloated by overhead. Starting with three employees, Eucleo has doubled in size. Mark's technical ability is legend among anyone with whom he has worked. His clear minded and clean approach to software creation is world class and highly coveted. Mark has broad experience with over a dozen programming languages, and deep experience in almost as many. However, it is with Java and associated systems that Mark shines. Mark is a true Java expert and provides technical advice of the highest integrity. A top thinker in the fields of Software Engineering and Computer Science, Adrian also manages Eucleo's day to day finances. As a co-founder of the company, he is fully dedicated to its mission and success, and works regularly with Mark and the rest of the company to ensure that we are constantly improving as a whole. 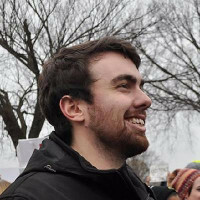 Adrian holds a Bachelor's degree in Computer Science from the Virginia Polytechnic Institute and State University, in Blacksburg, VA, and received his early education in the highly respected Thomas Jefferson High School for Science and Technology. Adrian has deep knowledge of Java and C++ with significant experience in at least a dozen more languages and technologies. Most recently, Adrian's technical interests have focused on Android development, specializing in integrating with new and leading edge hardware of various types. In addition to being an excellent overall software engineer, Mary has become highly sought after for her design and implementation advice regarding user interface development. With a mind that sees problems in a unique light, Mary often provides brand new perspectives and approaches that end up becoming institutions across the team. Mary received her Bachelor's Degree in Computer Science from the University of Arizona. In addition to a love for user interface design and human-computer interactions, Mary has come to love the constant set of fresh challenges that always come with Android App development. David Itkin is Eucleo's wisdom backbone. With an outstanding set of software architecture, design and development skills, David also has the most real-world experience. His opinions are always valued, grounded in a thorough understand of computer science and software engineering, coupled with a rich set of work experiences. In addition to constantly honing his software engineering skills, David is also interested in several areas of computer science, mostly centered around algorithms and number theory. David has complete and thorough knowledge of Java and C++, and just about the same level with many many more languages and technologies. The guy has just been there and done everything. Lance Whitesel is Eucleo's top glue man. In addition to a rock solid set of software engineering skills, Lance also has a great set of communications skills. This combination has helped him develop an ability to explain complex problems in simple terms. This thought process naturally spills into a love for working together with teams of outstanding engineers to create great software. Lance received his Bachelor of Science in Computer Science from University of Mary Washington, and received his Master of Computer Science and Software Engineering from George Mason University. His primary interests are simple software construction, test driven development and other automated testing techniques as much as possible, creating software that makes complex problems appear simple, and most importantly: using any and all of his skills to somehow save lives. After working side by side with many of the Eucleo engineers for over five years, both he and Eucleo realized what a great match they were for each other, and in 2016 decided to join forces. Steve has been in the software engineering field for 22 years and has spent that time honing a set of skills that specialize in the place where software and hardware meet. Steve has extensive experience with Java and Android, OpenGL and C/C++, all of which he put to use for a project called Crystal Hull, which provides a way for a user to remotely see a 360 degree view of any arbitrary space using a specialized set of cameras, an Oculus Rift viewing device, and some really cool software designed by Steve. Steve received his Bachelor of Computer Science degree from the University of North Florida. It was during his college years when he developed a love for his favorite hobby, scuba diving. To this day, Steve regularly dives whenever he gets a chance. Price is Eucleo's newest addition. Price's love for programming stems from his love of building systems and its intersection with human psychology. Price loves working with people at every stage in the development lifecycle to produce excellent tools that users find intuitive and performant.